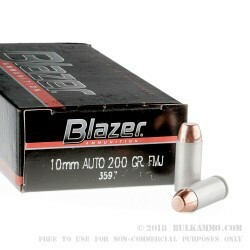 A throwaway casing, and an easy way to get some practice time in for the usually much more expensive to shoot 10mm, the Blazer aluminum cased 200 grain load is still a stiff 10mm cartridge, but offers a cheap alternative to other rounds. Putting out 490 ft. lbs. of muzzle energy and 1050 velocity, this is still close enough to give you consistent performance relative to your personal defense rounds, but it also gives a bit of respite form the punishing power of the 10mm comparatively. 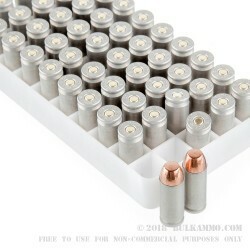 The aluminum case is not reloadable, but that contributes to the overall low cost of the ammunition. 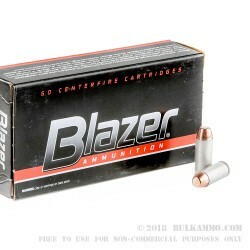 Combining that low cost with the very good reputation that Blazer (made by CCI) has formed over the last couple decades with range goers, and you have a compelling case for buying a ton of this ammo to shoot all year long. The feeding and extraction are all excellent for this round, and generally the only time you might find some sticky cases, is when you push it hard through the heat in a dirty high tolerance 1911 build or similar. A bargain for a usually very expensive range round. Suitable for use in any “10mm” firearm. 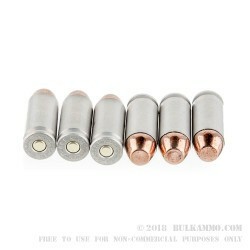 Q: Are these lead bullets or no? A: Hello Ian, This ammunition is loaded with a lead core, copper plated projectile.